KAI CHANG is a professor in the Electrical Engineering Department of Texas A&M University where he teaches and performs research in microwave devices and circuits. Previously he was a section head at TRW, Inc. where he was responsible for millimeter-wave integrated circuit component and subsystem development. Prior to this, Dr. Chang was a supervisor at Hughes Aircraft Company, where he was involved in the development of microwave circuits, millimeter-wave oscillators, and power combiners. 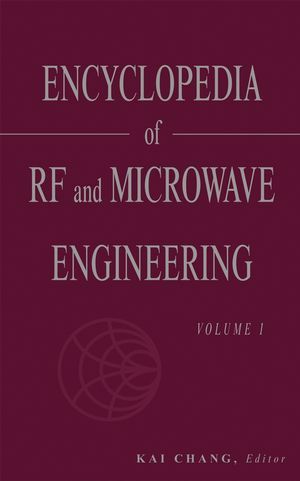 Dr. Chang is the author of a number of book chapters and has published over 90 technical papers on microwave circuits, components, and subsystems. He earned his PhD in electrical engineering at the University of Michigan. A/D and D/A Conversion Architectures and Techniques. Active Filters: Overview of Active Filter Structures. Active Filters: Tools and Techniques for Active Filter Design. Analytical and Adaptive Modeling of Nonlinear High Power Amplifiers. Antenna Arrays for Mobile Communications. Application of Wavelets to Electromagnetic Problems. Applied Numerical Electromagnetic Analysis for Planar High Frequency Circuits. BiCMOS Devices and RF Integrated Circuits. Biological Effects of Radiofrequency Energy as Related to Health and Safety. Calibration of a Circular Loop Antenna. Computational Electromagnetic Scattering Models for Microwave Remote Sensing. Coplanar Waveguide (CPW) Transmission Lines. Direction of Arrival Estimation and Adaptive Processing Using a Conformal Phased Array. Dual- and Multi-Frequency Microstrip Antennas. Electromagnetic Bandgap Assisted Bandpass Filters. Electromagnetic Field Computation in Planar Multilayers. Enhancements of the Finite Difference Time Domain Method. Fast Fourier Transforms and NUFFT. Fractal Shaped Antennas: A Review. Gallium Arsenide Technology and Applications. Gunn or Transferred-Electron Devices and Circuits. Impedance Transformers and Matching Networks. ITS Radio Service Standards and Wireless Access in Vehicular Environments (ITS-WAVE) at 5.9GHz. Leaky Modes and High-Frequency Effects in Microwave Integrated Circuits. Left-Handed Materials for Microwave Devices and Circuits. Low Temperature Co-Fired Ceramic (LTCC) Technology in RF and Microwave Engineering. Measurement of Near Fields Using a Modulated Scatterer. Medical Imaging with Microwave: Thermoacoustic Tomography. Microwave and Radio Frequency Multipliers. Microwave Photonics: Technological Evolutions and Its Applications. Microwave Scattering Models for Earth Terrain. MIMO Systems for Wireless Communications. Miniaturized Packaged (Embedded) Antennas for Portable Wireless Devices. Mixed-Signal CMOS RF Integrated Circuits. Monolithic Microwave Integrated Circuits (MMICs). Monte Carlo Simulation in Reliability. Neural Networks for Microwave Circuits. Packaging RF Devices and Modules. Parallel Algorithms and Computing for Large-Scale Electromagnetic Simulation. Parameter Estimation from Electromagnetic Simulations Using Signal Models. Personal Area Networking with Bluetooth. Phase Locked Oscillators and Frequency Synthesizers. Quadrature Phase Shift Keying (QPSK). Radar Remote Sensing (changed from "Remote Sensing by Radar"). Radar Remote Sensing of Irregular Stratified Layers. Radio on Fiber Systems (RoF Systems). Radiowave Propagation in Multipath Channels. Reflector Antennas (Parobolic Antennas, Dish Antennas). Refraction and Attenuation in Troposphere. Rough Surface Scattering: Numerical Simulations and Applications in Microwave Remote Sensing. Schottky Barrier Diodes and Their Applications. Signal Fading in Radio Communications . Sky Wave Propagation at Low Frequencies. Sky Wave Propagation at Medium and High Frequencies. Spatial and Quasi-Optical Power Combining. Standing Wave Meters and Network Analyzers. Superconducting Filters and Passive Components. Surface Acoustic Wave Delay Lines. Television and FM Broadcasting Antennas. Terahertz Science, Engineering and Systems - from Space to Earth Applications. The Coulomb Gauge in Electromagnetics . Thermal Analysis and Design of Electronic Systems. Transmission Line Matrix (TLM) Method. Uniform Geometrical Theory of Diffraction. Volterra Modeling in Analog, RF and Microwave Engineering. Wideband Slot and Printed Antennas.